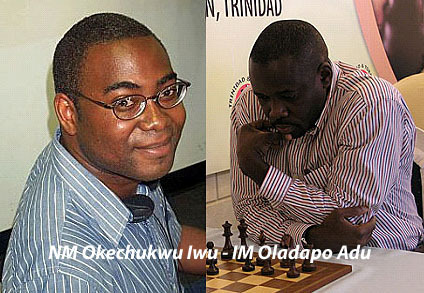 The Chess Drum presents its latest gamecast lecture in an instructive game between two Nigerians, National Master Okechukwu Iwu and International Master Oladapo Adu. The game had some interesting themes including a positional exchange sacrifice leading to lasting pressure. The game ends in a tactical skirmish. Very exciting! Enjoy! Thanks to Adu for that insite. Great game! a) I play both king’s indian and Grundfeld so whose idea can i use! b). In many openings( ruy lopez for instance) if black plays …b5 white can expose black’s queen side with a4″ can I reverse the colors?. 7… Qxd5 8.Nc3 Qd8 (perhaps 8…Qh5) 9.Bg2 c6 10.0-0 cb5? a move of a man who has been surprised? I had spent abt 10min looking at 10….Ne4 to exchange on c3 and exchage queens. White will have a weak queen side and black has some posibilities with a passed pawn! but I thougt its equal, I wanted more! ?